A new landmark report by the Climate Council has investigated the future of Australia’s electricity sector, finding that a swifter transition to a clean energy future is required in order to prevent increased risk and cost. The summary of the report’s findings (below) has been taken its entirety from the original post, which can be found here. See the 3 minute video summary. Australia must reduce its greenhouse gas emissions substantially to tackle climate change. The electricity sector accounts for 33 percent of Australia’s greenhouse gas emissions – the single biggest source of emissions. 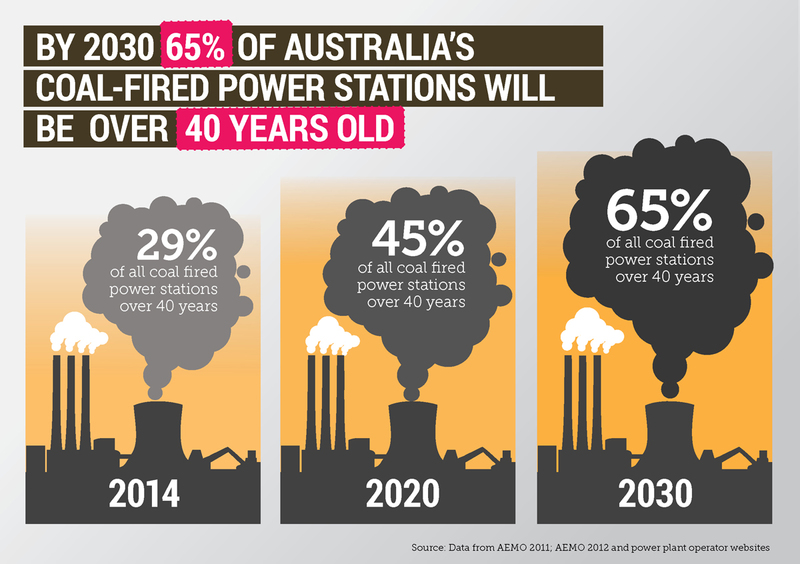 Australia’s coal-fired power stations are old and inefficient and will need to be retired or replaced in coming decades. This offers Australia the opportunity to fundamentally rethink our energy system. The inefficiency of Australia’s electricity generation means the country produces more greenhouse gas emissions per unit of electricity than almost any other developed country – as well as, China and oil-rich middle eastern nations. Overall Australia is one of the world’s ten biggest emitters of greenhouse gases from electricity and heat production, and of these major emitters, has the highest per capita emissions by a wide margin. Continuing to burn coal for power in the traditional way is incompatible with deep cuts to emissions. It is unlikely to be practical or economic to retrofit most of Australia’s old fleet of coal-fired power stations with Carbon Capture and Storage (CCS) technologies. The least expensive zero emission option available at scale for deployment today in Australia is wind, closely followed by field scale solar PV. These costs are falling fast as take-up globally accelerates. Wind should be 20-30% cheaper by 2020, solar PV is expected to halve in cost. Internationally, the costs of wind and solar PV renewables are generally lower now than coal plants with CCS. With Australia’s increasing gas prices, electricity generated from wind is already competitive with new gas plants, even without CCS, and lower cost than gas with CCS. Worldwide, new capacity added in wind, solar PV and hydro is already far greater than fossil fuelled energy – over 100,000 MW (more than twice Australia’s total power capacity) are being added each year. Wind capacity is forecast to double worldwide by 2017. China will be the leading country, with capacity more than doubling to 185,000 MW, followed by the USA (92,000 MW), Germany (44,000 MW) and India (34,400 MW). Global PV capacity has been growing, on average, over 40% per year since 2000 and there is substantial potential for long-term (decadal) growth. In the USA, for the past five-years, solar thermal power capacity has been increasing at 45 percent per year. While Australia overall is not keeping pace with international investment and uptake of renewable electricity, there are some Australian jurisdiction exceptions where renewable leadership is world class. South Australia has world leading wind and solar power, Queensland is strong in solar generation, and the ACT is on track to make 90% of its power from wind and solar by 2020. By the end of 2013, over 1,100,000 Australian householders had installed solar PV on their roofs to reduce their exposure to higher power prices. 10,000-15,000 more homes add solar PV each month. During summer heatwaves in 2014 in South Australia and Victoria, electricity prices were at least 40 percent lower than they would have been without the contribution of wind energy. Over each full year, renewables reduce power prices in Australian states where wind and solar PV penetration is high. This is also true overseas, in places such as Texas and Germany. Competitive low emissions electricity is fundamental to long-term wealth creation and a healthy future for Australians. Urgent action is required to prepare Australia’s electricity sector for the near future – it takes over a decade to plan, design, finance, and build major new power infrastructure. Australia’s market and regulatory structures will need to adapt to cope with the global shifts underway and accelerating growth in distributed low/zero emissions energy generation and storage. Strategic transmission infrastructure investments would open up vast untapped Australian renewable resources for development. We Australians do not need grid connected power! We have everything we need for stand alone power. When the word gets out, the government will be left scratching their heads and some companies will be left very grumpy. When the people make the move to stand alone power there will be nothing anyone can do about it. Despite Conservative governments doing their best to put roadblocks in the way, the shift to renewables is on and it will just be a matter of time before the smokies and fossil fuel fired electricity will be a minor player. The AEMO has finally recognised that our peak electricity use occurred a couple of years ago and will likely not be matched for a couple more decades. Meanwhile Denis Napthine provides a $25 million subsidy to a Chinese company in the Latrobe Valley to make briquettes from brown coal for export. Never mind that previous attempts failed dismally. When the penny finally drops and politicians realise there are votes and jobs in renewables and associated technologies, change will speed up – hopefully, in time to make some meaningful difference combating AGW. We have to be optimistic because the alternative is a real worry. Previous Previous post: Global Wind Energy Day picnic at Parliament – You’re invited!